Wed., Nov. 8, 2017, 4:22 p.m.
All teams will play second match TBD on same day. 4A (Kennewick): Mead vs. Eastmont, Friday at 1:30 p.m.
3A (Kennewick): Mt. Spokane vs. North Thurston, Friday at 8 a.m.
2A (Lacey): East Valley vs. Sehome, Friday at 9 a.m.; Pullman vs. Tumwater, Friday at 11. 1A (Yakima): Freeman vs. Lynden Christian, Lakeside (Nine Mile Falls) vs. King’s, both Friday at 3:15 p.m.
2B (Yakima): Colfax vs. Toutle Lake, Liberty vs. Kittitas, both Thursday at 11:45 a.m.; Northwest Christian vs. Tri-Cities Prep, Thursday at 1:30 p.m.
1B (Yakima): Oakesdale vs. Mount Rainier Lutheran, Selkirk vs. Puget Sound Advent, Odessa vs. Three Rivers Christian; all Thursday at 8 a.m.; Colton vs. Entiat, Almira/Coulee-Hartline vs. Firm Foundation; both 9:45. You can forgive Mead if it enters the State 4A volleyball tournament with a chip on its shoulder. Runner-up last season to Auburn Riverside, the Panthers enter the tourney this weekend as Greater Spokane League champion, District 8 champion, and undefeated in league and postseason. Yet, the Panthers enter the tournament ranked second in the state coaches’ poll behind – you guessed it – Auburn Riverside. 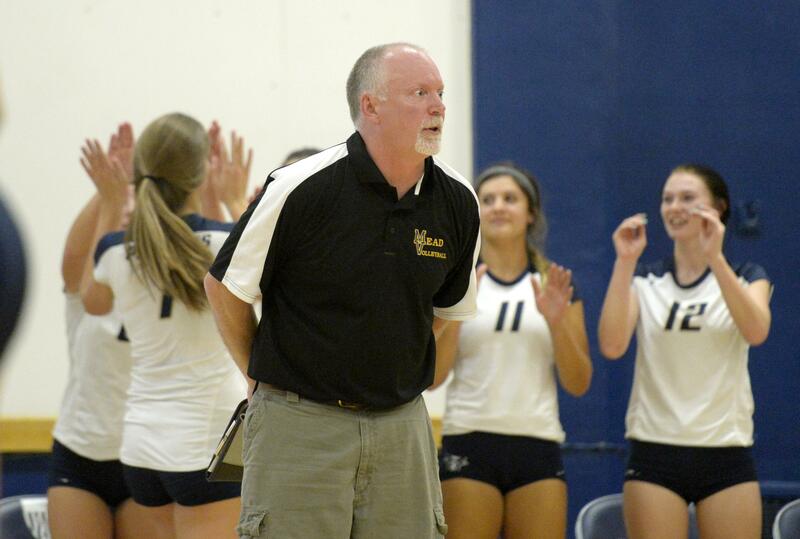 The volleyball program at Mead is a storied one. The Panthers have earned seven state championships since 1999 – but none since 2009. They came tantalizingly close last year. So, do the Panthers feel like they have some unfinished business to take care of Friday and Saturday at Toyota Center in Kennewick? Coach Shawn Wilson concurred with his star. “You know, the girls certainly feel that way,” he said. “I have a lot of returners. They were upset with how last year finished. They’re looking forward to this year. They have a little chip on their shoulder right now – something to fight for. There are 15 teams in The Spokesman-Review’s coverage area playing at state this year. Just in sheer numbers, it makes Spokane something of a hotbed of volleyball. “I think it is (remarkable),” Wilson said. “It seems like consistently year in and year out (the GSL schools) have really good representation (to state). “And then I look at the paper and see all the 2As and the 1As and the rest are doing the same thing. One of those smaller schools is Liberty, in Spangle – population 297. Unlike Mead, Liberty is not a perennial volleyball power. It’s the first time that Liberty has qualified for state volleyball as a 2B school, and first time since 1975 (1A) at any qualification. The last time Liberty qualified for any girls sport other than track and field was in 2009, for the State 2B basketball tournament. Liberty lost a loser-out game to state last year, so getting over the hump was “a great accomplishment for the program,” according to Lancers first-year head coach Kaci Tee. Tee previously coached at Tekoa-Oakesdale – which qualified this year individually as Oakesdale – and qualified for state several times. She doesn’t see any reason why that can’t happen at Liberty. Though Liberty doesn’t have volleyball pedigree as some of the other area schools, Tee doesn’t see the situation as a fluke. Tee thinks the volleyball movement in the area can be traced in part to getting younger kids involved. Tee said that while her players are excited about representing Liberty at state for the first time, they also realize that they still have to perform on the court. “I think they’re pretty focused on the mission,” Tee said. “We’ve really tried to ingrain in them to enjoy the moments, but also we’re going down there to compete. Published: Nov. 8, 2017, 4:22 p.m.